According to legend, the Ogre (Wuyak-kuita) was paralyzed and in order to get around was carried by a friend, the Mudhead (Koyemsi), who was blind. Together they were able to hunt, travel, and accomplish many tasks. After their very long journey, they meet all the Katsinam and are healed. This Katsina is the true definition of teamwork. Milton Howard is easily one of the most sought after artists of his generation. Born on the Navajo-Hopi Reservation in Tuba City, Arizona in 1964, Milton eventually moved to Albuqueque, New Mexico and spent the majority of his adult life there. Milton's father was also a carver, and he learned his craft from his father and other members of his family who shared his father's passion. Before launching his career as a full time carver of Katsina collector dolls, Milton Howard gained certification as an electrician. His first sale of a Katsina doll was to a classmate while he was in his early twenties and still studying for his electrician's certificate. During this time he spent much of his free time exploring the art of Katsina doll carving with his cousins, and began to take orders from classmates and friends. Though Milton Howard's talent was obvious to all those around him, he did not take up carving seriously until he moved to Phoenix. 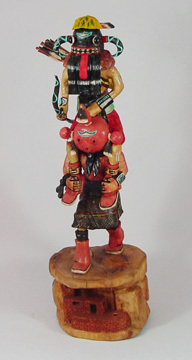 Here he honed his skills as a carver of Hopi Katsina dolls, and his name quickly began to spread as a coveted artist for collectors around the world. 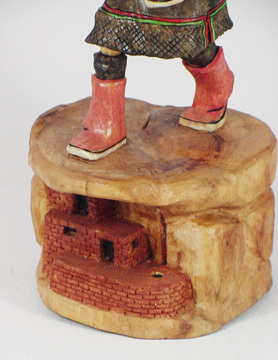 At the age of thirty, Milton Howard decided to dedicate his time completely to his Katsina carving talents. 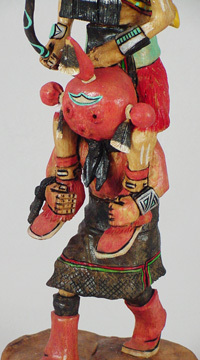 His collector Katsina dolls are now found all around the world in fine art galleries as well as in private collections. Though Howard's immense talent are obvious to even the most casual observer, one additionally element to his success has been the fact that he offers these amazing pieces as rather modest prices, so even collectors with limited budgets can own one of his spectacular Katsina dolls. Though Milton Howard remains dedicated to the traditions of his heritage, he has also learned to express himself through his collector Katsina dolls with a delightful and readily recognized sense of humor. 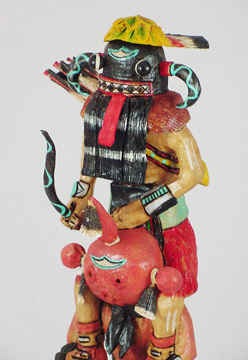 Many of his Katsina dolls will depict non-traditional scenes, but with accurately detailed representations of the Katsinam he cherishes as sacred symbols of his Hopi culture.